If you have your own brushes, palette knives and paints, do bring them along. If you are starting out & would like to try out materials & equipment on a course before buying your own, or if you are travelling light, then studio paints are available for an additional €5 per day. A pencil, a flat palette, kitchen towel and baby-wipes are handy, but I have plenty of spares if anything is forgotten! A basic range of colours is all that’s needed to get started. 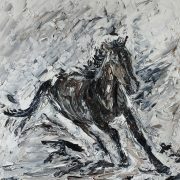 Daler-Rowney Georgian is a good brand and from personal experience I would recommend their range of paints. Try to avoid cheap brands of oil paint as these are difficult to paint with and their colours lack vibrancy. 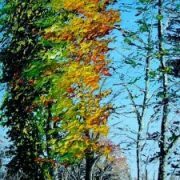 I use the palette knife a lot and I suggest one large and one small diamond-shaped palette knife, Winsor & Newton 20 and 25 are ideal. As for brushes, there are many different shapes and sizes, and they can be expensive. It’s good to start with a selection, and not to spend money on expensive brushes until you know which ones you like and will use. 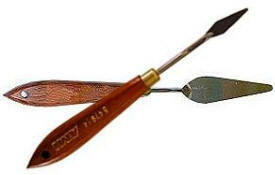 I find that a couple of ½ inch flat brushes are useful and a small and a large round head bristle brush. Also, a very fine “zero” size brush with long bristles is handy. 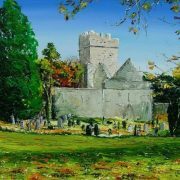 You can buy paints and brushes on line at Cork Art Supplies or in Killarney in The Dungeon where they have a great range.